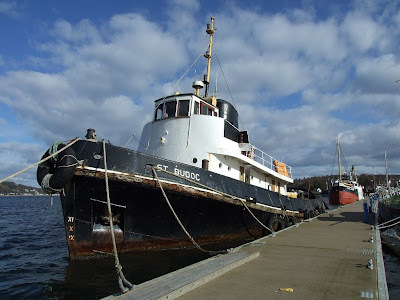 Having moved around ten days ago from her mooring in the Holy Loch, to one of the pontoons at the Holy Loch Marina, Sandbank, the tug ST BUDOC is currently being prepared to sail to Fleetwood, where she will be slipped for hull cleaning and routine underwater work. She was sold a few months ago and considerable work has already been carried out on her machinery, including the installation of new generators. ST BUDOC's new owners plan to use her in Liberia, where it is planned that she will tow barges taking timber from rubber plantations.